No plan survives contact with the enemy... or in this case, no campaign survives contact with the players, at least in its initial form. I've been busy revising a lot of my campaign tools this week to increase utility for the table top; all those random tables of which I was so proud are getting turned into spreadsheets to generate content in advance for faster use at the table. I've converted the ship generator, name generator, hex content stocker, and just put together a simple spreadsheet for rolling up NPC retainers. 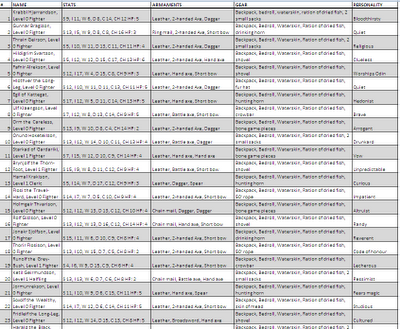 Here's a snapshot or so of 20 retainers appropriate for a Viking themed game. On the island of Thule, retainers become available a number of ways. Some men hire onto larger ships as rowers, sailing to Thule to contract out as mercenaries. Sometimes there is a falling out with one's own crew. And lastly, they're survivors of a failed party seeking to catch on with a new group. 1. The PCs in my current campaign have quite a lot of retainers (and dogs). The game is faster and simpler if I don't have to remember whether Fred the fighter gets +1 on saving throws vs. magic, or whatever. 2. In the event of PC death, it means a retainer can be promoted to PC if a player wants to do so, and the player then gets to roll ability scores, which is more satisfying somehow (if not entirely "logical"). Beedo, you may have already mentioned this, but are you planning to put out compilation of your Black City Campaign? 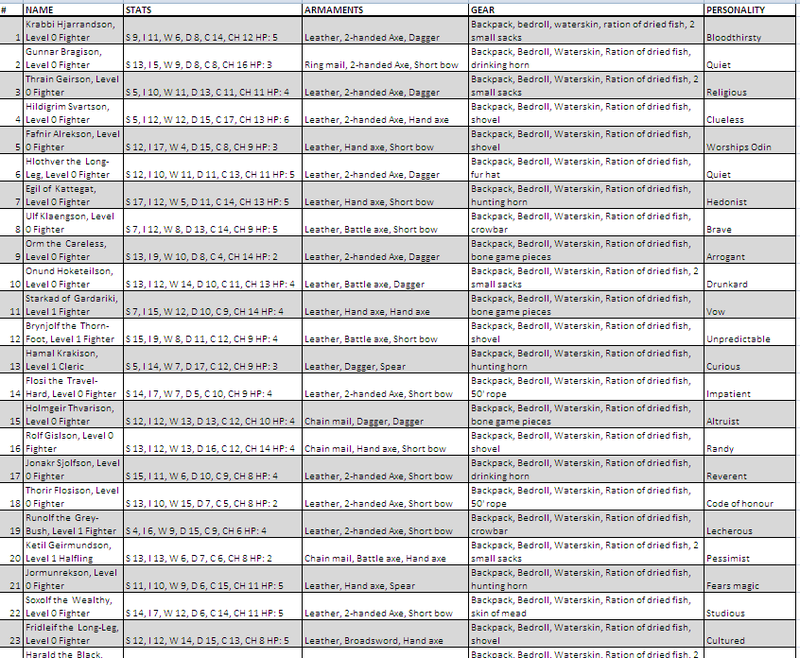 Yes, definitely planning to compile it all into a campaign setting. It seems to be breaking the mold in an interesting way... lots of people build stuff the other style, "here's something fairly generic, it can plug into any old D&D world" whereas the Black City includes tons of Norse flavor and details for a specific type of campaign - playing characters inspired by the Vikings, traipsing around a horrible alien ruin, and trying to avoid all the fellow raiders that want to rob you. @Claw: the ability score question is interesting, you're right that it's almost entirely superfluous. Challenge your own assumptions - I need to take that to remember that. The scores are a carryover from when the PC's always rolled retainers as henchmen. On the other hand, it's no effort to program the score generation into excel (it's not like they have to be rolled individually) so I'll probably leave them. I think the ASE model would fit The Black City rather well. Though hopefully you will include more than one dungeon level. Makes sense. I use Meatshields, so all the retainers come without ability scores anyway. The only thing I add is random headgear. I'm glad to see, looking at Hlothver the Long-Leg, that there's an element of random hattitude even for vikings!